Ohlins offers their competition series Ohlins TTX (Twin Tube) Race Shocks for most all modern Supersport bikes. The TTX series of race shocks is a 36mm shock with compression and rebound located in the top of the shock. Numerous spring rates are available for every bike, linkage and rider weight combination. Ride height is adjustable to vary the motorcycles rake, trail and swingarm angle. 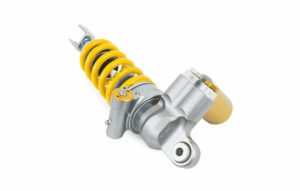 We stock Ohlins shock springs for the Conventional 46 series shocks in all different lengths. We keep expansive inventory on the ‘older’ style Ohlins 1093 series of 2.25” ID springs, as well as the newer 21040 family of springs found on the Ohlins TTX shocks, which is a 2” ID spring, in various lengths and rates. For a massive improvement in damping control we offer the Ohlins NIX30 for bikes with 41-43mm + forks and NIX22 cartridges for smaller race bikes like the R3 and the Ninja 300. For serious racers we offer Ohlins FKR pressurized fork cartridges for the utmost in rider feel. A pressurized fork can operate at much higher velocities without cavitation, and cavitation provides vague fork feedback. Ordered by application with springs custom selected for your weight height and riding style. We stock Ohlins Fork Springs for your OEM forks and for all our Ohlins performance cartridge forks. OEM fork springs traditionally have a taper on one end to locate to the fork spring spacer while performance cartridges like the FKR 100, NIX30 and NIX22 use a ‘straight’ spring in a more standard length than the OEM offerings. We stock hundreds of Ohlins fork springs in various rates and lengths. Some Ohlins Piston kits are available for the older 20mm cartridges that were commonplace for decades in almost every race bike with cartridge forks. Before the Showa BPF damping system started to propagate across the current sport bike range, most Showa and KYB Cartridge forks used a standard 20mm piston assembly with large port pistons designed for comfort over control. Contact us for availability. Ktech has grown to be one of our largest suppliers for Race fork cartridges. Offering a full line of performance shocks and fork products, they are proudly manufactured in the United Kingdom. Ktech fork cartridges were selected for all the Kawasaki Ninja 300 Cup bikes in 2016, and most of the bike in the CSBK Lightweight Supersport class in 2018. Accelerated Technologies and Jodi Christie won 4 consecutive CSBK Pro Championships and many, many races with their DDS fork cartridges without one revalve. We ran them as valved from Ktech. Ktech supplies us with beautiful product of the highest quality. Accelerated Technologies offers Ktech DDS Lite and DDS Pro Road shocks for big bike Track day and racing applications, while their Razor, Razor Lite and Razor-R shocks cover most smaller bike and twin shock race bike applications. For Ktech Shocks as well as OEM street bike applications, we stock many different rates, diameters and lengths of Ktech Shock Springs. We have won Many Canadian Races and Championships on Ktech Fork Cartridges here at Accelerated Technologies. The Ktech DDS (Direct Damping System) of pressurized cartridges is Ktechs highest spec race cartridge and is available for most Super Sport applications. For newer Supersport bikes that came with Showa’s BPF fork, we offer the Ktech IDS (Independent Damping System). The IDS has rebound in one leg and compression in the other leg and both legs can adjust preload from 0-18 turns. The IDS is our go to for most track bike and race customers that want Preload, Compression and Rebound damping externally adjustable in the top of the fork caps. Finally, Ktech has their RDS (Rod Displacement damping System) for OEM applications that have the stock compression adjuster down by the axle. All options are of the highest quality, come sprung for your weight, bike and riding style and can be professionally installed here at Accelerated Technologies. We stock Ktech Fork Springs for your OEM forks and for all the Ktech race cartridges. OEM fork springs traditionally have a taper on one end to locate to the fork spring spacer while performance cartridges like the DDS, IDS and the RDS use a ‘straight’ spring in a more standard length than the OEM offerings. We stock hundreds of Ktech springs in various rates and lengths. Available in 7 lengths to suit many applications, Ktech Steering dampers are fully serviceable, lightweight and come with mounting kits for your bike. Shipped complete with Piston holders and new damping needles, the Ktech SSK Piston kit for the street and Ktech SSRK Piston kit for the track offer flow improved pistons to give enhanced feel and control at both elevated speed and expectations. Offered for most bikes with 20 and 25mm cartridge forks. These kits are an option for Race and Track bikes like the GSXR, R6 and R1, the Triumph 675, Kawasaki ZX6 and the Honda CBR 600 and 1000 before these bikes were fitted with the Showa BPF. Most applications are from 1990 to 2011-2013. Note: The Yamahas have never used Showa product, they used KYB and Soqi for their race bikes. We have been using Hyperpro more and more the last couple years and they have blown us away with their appearance, build quality and accurate calibrations. This has become one of our go to shocks for Race bikes with less common fitment lists or older bikes that perhaps have dropped off the fitment guide of other shock manufacturers. Available in several length, colour and style options, the Hyperpro steering dampers are super high quality with a nitrogen pressure charge similar to a shock absorber to best combat heat and impact shock. Again offering OEM and Race springs in Linear and Progressive rates, Hyperpro Shock Springs are custom selected for your street bike, weight, height and riding style. For years, Penske have offered very high quality aftermarket shocks for many street bike applications. We see many brilliant features and innovations inside these US built shocks that are very high quality and we are proud to offer them at Accelerated Technologies. Offering options for sport bikes, Penske Shocks offer their 8900 series piggyback and hose mounted reservoir shocks for Motorcycles. The Penske 8983 is a ‘double adjustable’ shock with compression and rebound, while the Penske 8987 is a ‘triple adjustable’ shock featuring high and low speed compression along with rebound. For vintage applications they offer their Penske 8975 ‘double adjustable’ straight body shock (no rezzy) and the cheaper Penske 8900 ‘single adjustable’ rebound only shock. All are very high quality, rebuildable shock options. For riders of both vintage and lower cost motorcycles that aren’t outfitted with cartridge forks, damper rod forks are the norm. The Race Tech Gold Valve Emulator is a drop-in solution that sits on top of the damper rod and gives us the ability to custom ‘valve’ the fork. Still not externally adjustable it does not have the attraction and versatility of a replacement Ohlins or Ktech cartridge, but it allows us to set the fork up very well on the inside. At a fraction of the cost of a replacement cartridge it is an option that will yield a good result. Popular with our VRRA customers, Stadium Suspension provides us with excellent shocks made right here in Canada. Able to respond with our requests quickly and efficiently, we are proud to work with Stadium Suspension to exceed your expectations. Stadium makes us great shocks for most Japanese bikes. They offer their 740TR series with rebound and preload adjustability, 740HR1 with a hose mounted rezzy adding compression damping, 740PR1 with a piggy back mounted rezzy, and their 740HR2/PR2 adds high speed compression damping adjustment to the mix for the very discerning racer that loves to tinker. Offering thousands of custom and standard options, Stadium fork springs help us tune your bike to you. Stadium is our go to when we can’t get special springs anywhere else.